We we landed in the United States of America, it just so happened that we began with 2 nights in the ghetto - yep - I booked a cheap motel online for when we arrived and only going on the map, it looked pretty close to Hollywood. However, it's only when you actually visit LA do you realise the profound distance between places, and so, no, we were nowhere near Hollywood. It was interesting on entering the country and having a big scary looking Russian guy stamp our passports and take our fingerprints at customs as he asked if we had friends or family in the ghetto, which we replied no, and he then proceeded to tell us that it's a dangerous place, don't go out at night, and if we can, cancel our booking. Great start to the vacation, although B and I were laughing quite hard about it. Nevertheless we finally got there after long walks, buses, taxis and so forth, probably showered and crashed. To wake up the following day at half past midday - exactly why you don't want to pay big bux for a place on your first night in a different time zone. 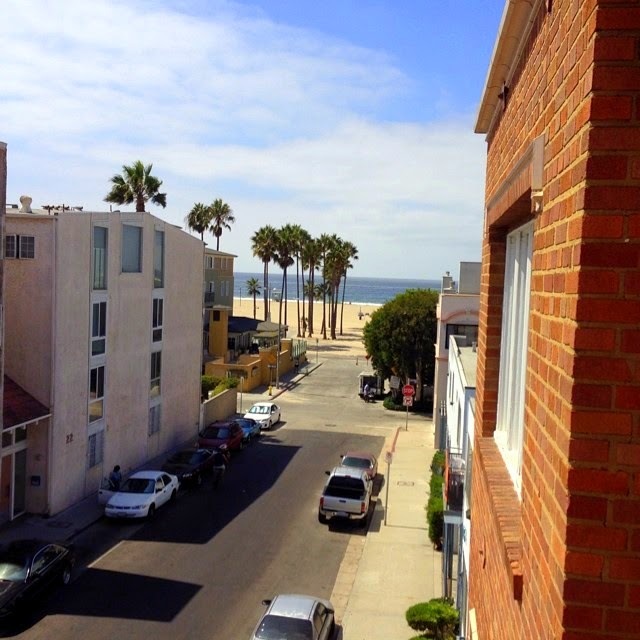 Moving on, we then booked 10 days in a Venice Beach apartment. Venice itself is lovely - very hip and trendy, a little expensive in parts, small enough to walk around with loads of amazing cafes, juice bars and yoga studios. The beach part is what brings people to the area I think - this is where homeless people, extroverted individuals, hawkers, street performers and "freaks" form the freak show kinda live I suppose. It's quiet in the mornings with happy sleepy faces drinking their take away coffees whilst pushing their trolleys full of suitcases or setting up their artwork to try and make some cash. As the day progresses, so too does the noise, the tourists, resident locals and interesting sightings. I fell in love with Venice even thigh the beach boardwalk wasn't really my favourite - it's very dirty, dusty and smelly unlike Santa Monica only a few kilometres up the road. The view from our apartment block - not a bad walk to the beach hey! Which brings me there. It was about a 25 minute walk from where we were staying and we walked in and out everyday except a few. There's plenty more happening over in Santa Monica, but I think that's exactly why I fell in love with Venice - it's a little more laid back. That and the magical vortex of energetic going on there. 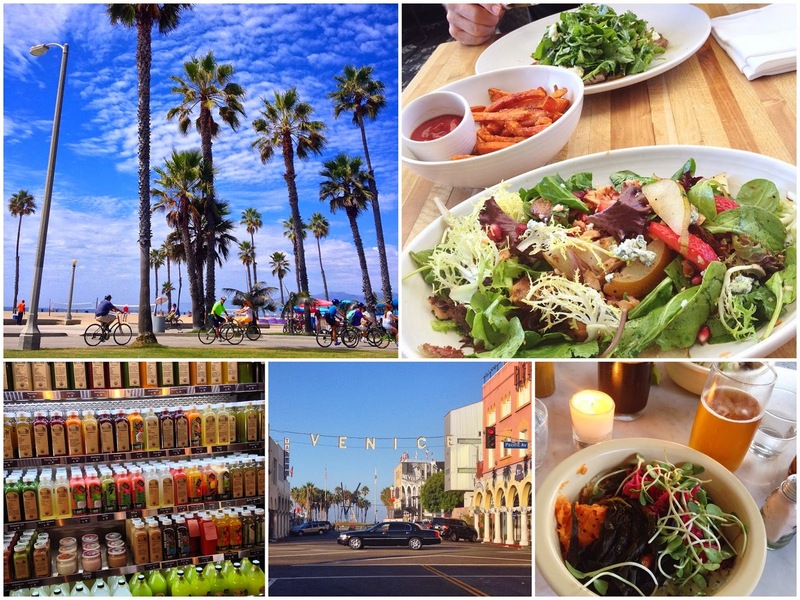 Santa Monica is picture perfect, and so much so, you'd probably recognise the pier, the ferris wheel and the roller coaster, from postcards and American movies alone.There are shops galore on many streets to meander through. You'll find everything you could ever need, want, think of, and more. Whilst staying in Venice we also spent some time with an Aussie friend named Andrew. He took us road tripping south for a day he had a meeting, and we managed to check out some of the Hurley Pro going on (as well as a few good looking surfers) and take a dip. We had French crepes in San Clemente, the best Mexican food of our life from a little family run place around the corner from Andrews, and saw many a Ferrari much to my excitement (dream car in case you didn't know). We also caught up with Jamie Louise who runs Orawgi raw food restaurant in Brisbane, Australia, for a drink here and there, and at the final free beach concert of the Summer that happens every week in Santa Monica. Talk about a cool place to be! 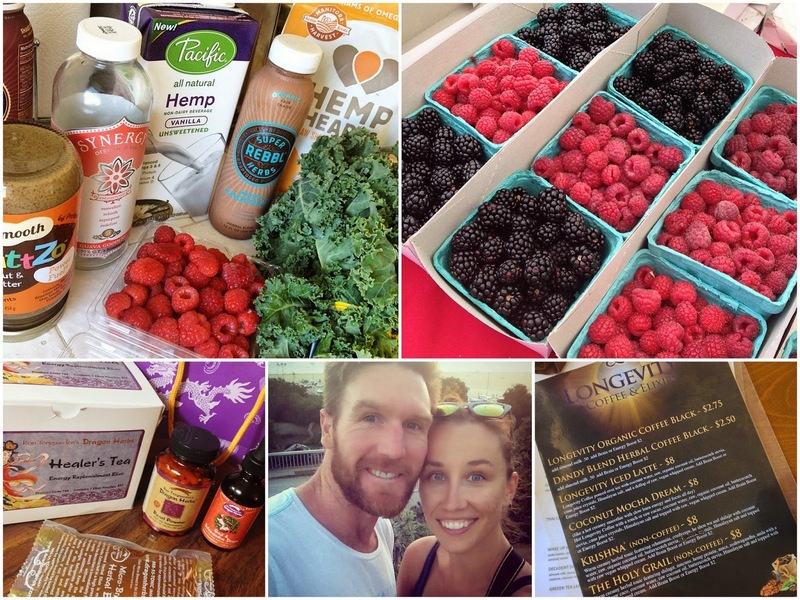 Shout out to Troy The Certified Health Nut as well - and thanks for the chit chats over juices. // Kreation - juices galore!! Like I mean, G A L O R E! // Cafe Gratitude - for the most nourishing foods, the most interesting beverages (into medicinal mushrooms, shilajit, and other stranger ingredients like us, get here), and the best conversation you'll ever have bumping into people. Oh and raw dessert! These guys also do great juice cleanses. // Feed - for a much quieter and classier luncheon, serving local food (that is amazing mind you) and alkaline water, but with the same price tag as regular cafe lunches. We went here a couple of times. Total fan. // Groundworks Coffee - we got hooked on their cold brew! // Wholefoods - for anything and everything a health nut could need (or want). And the one in Venice is huuuuuuuuuuuuggggeee!!!!! // Exhale Yoga + Spa - we got a 7-day pass for $30 and tried yin yoga, power yoga, barre classes, and managed to be there for an intro-party-night meeting new peeps and taste testing samples of local produce and beverages. // Burger Lounge - for a damn good burger that is made from damn good ingredients! The original grass fed burger bar. // Rawvolution - I don't love heavy raw meals anymore, but this place has incredible raw desserts, and Longevity low-acid coffees.... I had one made with coconut cream, brain boosting herbs, medicinal mushrooms and whatever else that made it the best ever, and had me feeling the best ever! // Real Food Daily - low fat, plant based, macrobiotic menu with some great thick smoothies (I'm not a fan when a smoothie is watery), and home made peanut butter cups!! // Ron Teeguarden's Dragon Herbs - if you're a fan of Traditional Chinese Medicine or herbs in general, look this guy up as he is an incredible wealth of knowledge and information. I've used his products before and love them, so when I saw the shopfront, I was instantly in! // Weekly Markets - the best place for fruit and veg, breads, cheeses (some raw), hot foods, famous waffles and pancakes, coffees, and more. So much produce is grown in Cali and shipped to the rest of America so when you can get it local at markets, do it! After our 10 days in our cute little apartment, we decided to hire a car and hit the road venturing north, coinciding with a 10-day cleanse we had just found out about - consisting of green drinks, an amino acid supplement, a fibre powder and liquid minerals, with additional organic berries, avocado and kombucha thrown in when we felt hungrier than usual. Santa Cruz - This place was magical. To begin with, we were given a guys number and told (by an Aussie friend of our Aussie friend, both living in LA, who we randomly met, spoke too, and vibed with) that we must call a guy named Tyler and catch up with him - coz we'd love him and we should definitely meet him. So we rang, asked if there was somewhere we could crash with our sleeping bags, and Tyler implied in his Steve Catrell accent, that all would be cool, taken care of, no worries, and to just come on over. By this time, we had been driving all day and I really wanted an early night with a cup of tea, after an afternoon walk, and to not have to really people-please with someone I had never met before. We pulled up at Tylers place, in a sleepy beach town appropriately named Pleasure Point, and long story short, we jumped on skateboards for a quick trip to the ocean. Then came back again. Brock grabbed a wetsuit and surfboard (one of about a dozen) and went for a paddle while Tyler got some food and I went for a walk. We all met back at the house, Tyler set u chairs in the front yard to watch the sunset, after he had boiled the kettle for cups of tea. And as we sat around chatting, the question around "what do you do?" sort of came up, and it turns out Tyler is one of the worlds biggest wave surfers!! and he has also recently started his own magazine; Santa Cruz Waves. The nicest, down to earth guy, randomly invites us in to crash on his couch, and he lets that outta the bag! We had many crazy moments like this in Cali! Big Sur - The following day we drive south to a national park area that stretches some distance along the coast, known as Big Sur. And it's stunning. Tyler and a few mates were also heading down for the day and we all ended up on a secluded tiny beach, where the ocean was cold as ice, and the boys had their paddle boards and wetsuits on, going spear fishing, whilst the girls there and I lay sun baking and chatting away. Another magical day. By 4pm B and I were heading off to find a place to sleep for the night. We drove up and down through Big Sur, stopping for a short waterfall walk, a lookout point, photo opportunity, or to just stretch our legs, and we found a place nestled amongst the Redwoods in a tent-cabin kind-of-a-thing which suited both B (who wanted to sleep outside under the stars in the dusty dirt) and I (who wanted to wake up not covered in mud). Two Irish were lads staying in the tent-cabin-thing next to us and we invited them over when B was amping up the fire for us to stay warm. They and beers and even though it was Day 1 of our 10 day cleanse, I had a sip or two and B had a beer or two. It was still liquid right? ;) Another awesome evening of banter, laughter and our green drinks, an early night for me in the trees, and another day of driving the following morning. San Fransisco - I was so excited we got here as B wasn't initially keen, being so far from LA. However after road tripping north of the city, and getting as far as Santa Cruz, it would be stupid not to go right? I still remember my trip there when I was 10 years old and I have loved the place ever since, so I was uber excited to play tour guide and show B the Golden Gate Bridge, the Bay Bridge, Pier 39 where all the seals sun-bake on the pontoons, the red-brick-winding-road that is Lombard Street, views of Alcatraz and the Observatory (both from Hollywood movies), the architecture (hello Mrs Doubtfire and Full House) and the general vibe that San Fran gives off - it is uncanny how similar it is to Sydney! 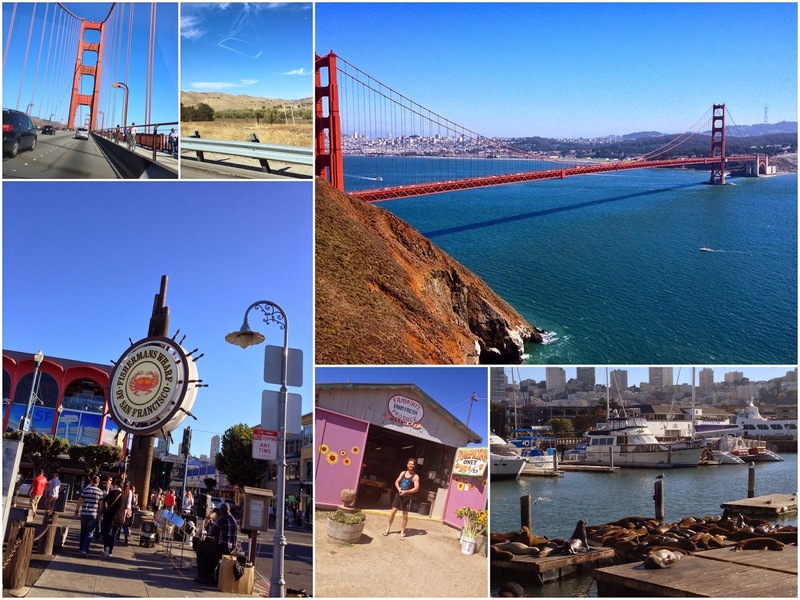 It was a whirlwind trip of San Fran in a day but we both loved every minute of it! San Luis Obispo - We stopped here on our way back south when we couldn't find anything in Santa Barbara and any stop would be as good as another we thought. And we both believe everything is always as it should be, so knew this place would be magic. We rocked up late in the dark so trying to find the right address, back door, and key left was interesting but we managed. It was the smallest place we had ever seen but it was perfect for what we wanted. There was a single mattress on two wooden pallets, with a small side table, and a toilet, shower, and sink up the other end of this petite rectangular room. Very cosy, very cute. We both slept like babies snuggled up together. The next morning we were up with our green drinks and off on our morning walk when we found fresh figs growing on a tree and stopped for a bite to eat. Oh my lordy, fresh figs are the best! And these were no exception. We ventured further and stumbled across car loads of young girls walking about (turns out they were sorority girls welcoming freshmand year) so we asked where the best coffee in town was. Just around the corner we head on in and get chatting to the barista who turns out to know Tyler and his housemate (who live over 4hrs away). Great coffee. Better banter. And we were off once more. The rest of that day was manly driving south some more - we stopped in Santa Barbara for a few hours and tracked down organic smoothie bar for some more sustenance as we were both feeling pretty hungry. We also came across free organic soup testings in a newly furnished market place which was very cool. We may or may have not stopped in once more at Venice and Santa Monica... I don't remember. I do remember at some point driving straight through down to Costa Mesa where we would be for the next 4 days as I had booked B and I tickets to the Womens Wellness Conference run by David Wolfe. I have seen and met David before and am instantly hooked into his enthusiasm and passion for nutrition when in his presence, so I was super keen for the next few days with him. And not one single moment of the entire time had me disappointed. Giveaways, new friends, inspired conversations, incredible new products on the market, exceptional speakers with exceptional information to share. Oh and the Tonic Bar!! Wowzas! But you wouldn't expect anything less from Mr Avocado himself. I'm writing a 7-Part Series on it all starting this Thursday so be sure to check back for that - I had that much information from it that I wanted to chunk it down for you, so I'll leave it there. Then we spent a few days on an outside bed surrounded by fairy lights, white drapes and a garden through Air BnB, with an incredible guy who has now become a friend. We didn't want to venture far as the following Thursday I began my retreat at the next beach down so we decided to kinda keep put and chill around the local area. We found an incredible coffee + chocolate cafe where we had one of the best cold drip coffees I've ever had - very strong, a little sweet, tall with extra ice - and I got to indulge in some barista banter taking me back to when that was my passion and profession. I got my nails done, had a wax, did some clothes shopping, bought B new skate shoes... we felt more like locals here as we were staying in someones home and kinda doing all the usual stuff. And I loved it! We also drove a beach or two away to check out Huntington Beach (where surf comps are held every year), Hermosa Beach and Manhatten Beach (where the Tone It Up girls live of course). 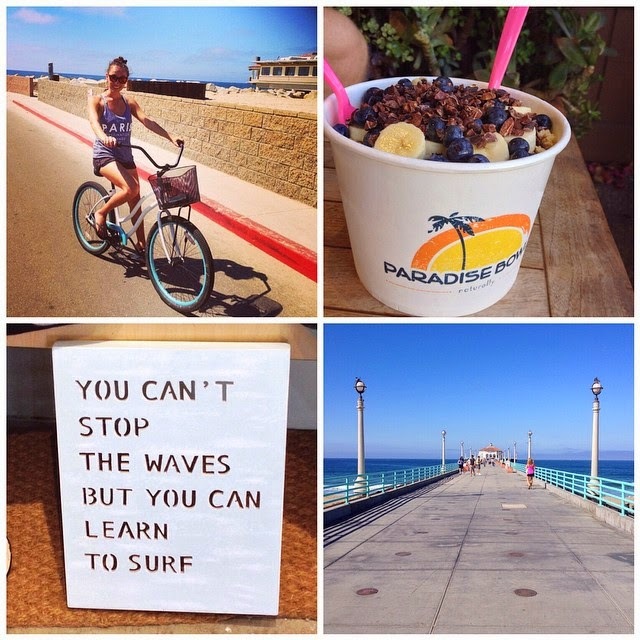 We hired bikes for an hour and rode as far as we could soaking in all the sunshine, and topped it off with the BIGGEST acai bowl either of us had ever seen! But before too long it was time, and I was dropped off at the Hyatt for what was to be the best 4 days of my life and where I got to meet these two incredibly gorgeous women - my online trainers. Leaving Cali was really tough for me - I cried. I didn't want my retreat to end more than anything, but I also didn't want to leave California and fly back home. Despite all the pollution and ridiculous traffic (seriously - both are stupidly crazy), I fell in love with it all, and could definitely see myself and B living there at some point. 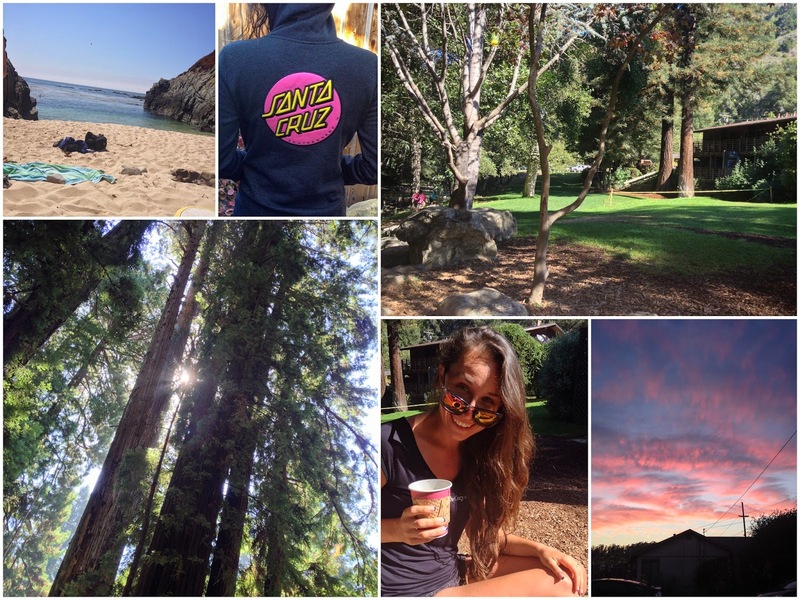 I love Venice but perhaps Santa Cruz is a better option for what we both love. Anyway, home is where the heart is I suppose and flying back home to Oz made me realise that for me, that place is no longer Sydney. I've lived in Cairns for over 3 years now, but still always loved flying back to Sydney. I do believe it is one of the greatest cities in the world, but little by little it's felt less like home for me, and our one-week trip there on our way back to Cairns from LA really concreted that in for me. Leaving Cali was hard, but as soon as I hit Sydney, all I wanted was Cairns. And here I am! Loving the 31 degree weather we're getting. Loving the walk to the beach. Loving seeing my bestie.